During their stay on the island our passengers make a first stop at Oia where they get the chance to enjoy world famous sites like the unique view from Kaldera, Oia’s commercial side, churches and traditional houses. 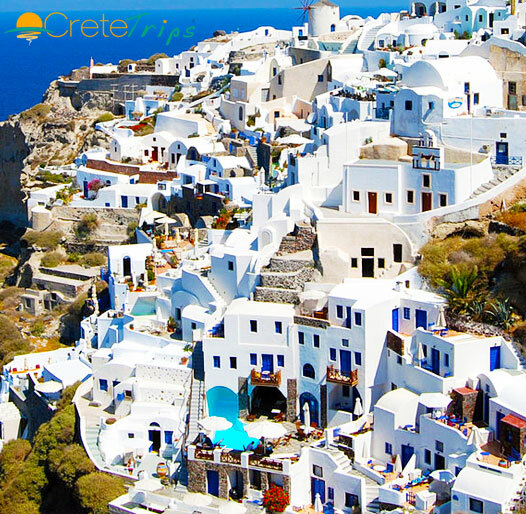 What follows is magnifiscent Fira, the capital of Santorini, for either one or three hours according to their tour of choice. Again, they have the chance to enjoy the view and Kaldera’s impressive rock cliffs. Passengers need to show their vouchers in order to get on the bus. Bus transfer is operated by CTS TRAVEL buses. Τransportation to and from Rethymno Marina port.